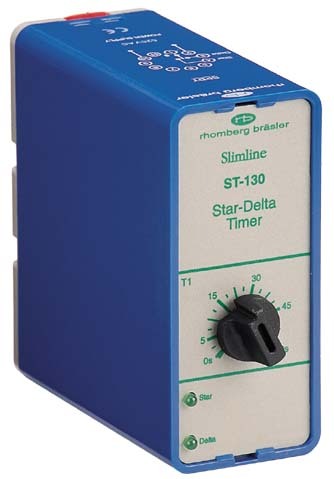 Rhomberg star delta timers control motor starting by timing the switching of the motor contactors from start to delta configuration, with a brief pause time inbetween. 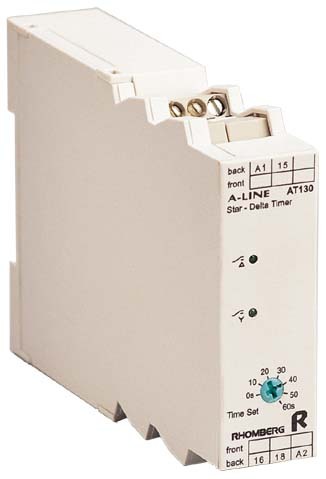 (Available in 11-pin plug-in and/or DIN rail format). Adjustable Star Time Range to 60 sec (versions only adjustable up to 30 sec available on request). Fixed 75 ms pause time to prevent overlap of Star & Delta switching (50ms version available on request). LED indication of relay output status. Two internal SPDT relays with neutral centre position ensure break before make. Adjustable Star Time Range to 60 sec. Fixed 75 ms pause time to prevent overlap of Star & Delta switching. Two internal DPDT relay method of interlocking ensuring break before make.